We rent our Weinsberg Orbiter 591MS, during periods when we do not use it himself. For more information on our site RV trotter. We usually rent by the week, especially during peak season. The rental period starts on Saturday morning 9 am and ends on Friday 17.00. This camper is suitable for 2 to 5 people. The layout is practical, comfortable. The sitting area and the long bank to turn into a very large bed. We go in pairs often in the low season road. In those periods, it may be that you sometimes sit inside and then the comfort of the long bench is very welcome. The end kitchen in the back is perfect. We have deliberately chosen an alcove because you will have plenty of living space in the camper. The Weinsberg Orbiter is known for his solid finish and very spacious and high alcove. The camper has ample storage space. The camper has a modern 2.8JTD engine with common rail injection. Therefore it has enough power and a relatively low motor noise. A week starts on Saturday between 9:00 and 12:00 and ends on Friday before 17:00. Get on Friday is possible if you have the good fortune that the motor home the week before is not rented. The camper must be returned clean (inside and out) and the (waste water tank should be empty and clean (the tank may be full). This discretion of the landlord. The camper / caravan insufficient clean, inside or outside, it is € 100, = deducted from the deposit. In the case of damage which the motor stops driving the motor home is insured for roadside assistance and repatriation. This insurance is a replacement vehicle for the lessee included until the end of the rental period, for up to 28 days. Drivers must be at least 25 years and at least 2 years have their driver's license. Of each director must be given a copy of driver's license. standing on the green card, except for advance risk indicated by the landlord. Indication of the country to visit is required. Lessor is not liable for personal or material damage by the tenant or his traveling companions, caused by the use of the motor, mechanical failures and / or collision damage. It may be that the motor still is replaced for the rental period by at least a similar model. The trip gebeid during the rental period is limited to European territory. to the deposit of € 1000 will be fully retained in the event of any damage to the motor, except for damage caused by external influences, such as blowout, hail damage or burglary, the excess is € 250. burglary a police report required reduce excess to € 250 .. In the event of damage to the contents and / or inventory we assess the damage and keep that amount in the deposit. The deposit (or what remains of it) will be deposited into your account within 14 days after the end of the rental period. All rental amounts are exclusive of fuel costs. The motor is supplied with a full tank to you and must again be delivered with a full tank. Otherwise € 100, = deducted from the deposit. The motor is supplied with two full gas tanks. Minimum hand with a full gas bottle. The costs directly related to the use of the motorhome, inter alia, fuel, oil, tires repair, fees, court costs, etc., shall be borne by the tenant. The necessary cost of normal maintenance and repair expense of the landlord. All fines and the like, caused by (traffic) violations committed by the tenant during the rental period will be charged to the tenant. If cancellation will not be refunded the amount of the rent paid in advance. When the rental period is canceled within 4 weeks will still have to be paid the total rental amount. You need to arrange a possible cancellation. By late pick up or drop off too early, no refund of (part of) the rental place. In case of damage (or defects), you must report this immediately by phone and always consult with us on further action. This applies to damage caused by a traffic accident, as all other forms of damage (or defects). We should also know this as soon as possible to prepare for a possible repair, so the tenant after you again get up on vacation. The damage is such that not (more) can be made of the camper, are rental costs of a replacement motor reimbursed. If no replacement motor is available, the cost of renting another vehicle. The benefit amounts to a maximum of € 200, - per day for the duration of the trip, but up to 28 days. Fuel is not reimbursed. Assistance section also applies to the replacement RV or other vehicle. Tenant may not require lessor to the provision of a replacement vehicle. You are not entitled to any form of compensation whatsoever. If it appears that prior to leaving the camper (by accident or mechanical failure) can not be rented out in advance of the rental period, no replacement transport can be claimed (we have only one motor). Then if it is decided to waive the rental will be refunded the full amount paid in advance. With each collision the local police should be involved and to be completed at every damage a European damage. The camper's all-risk insurance. The excess per claim € 1000, =. The damage covered by insurance does not, for example as a result of driving under the influence or control by allowing unauthorized people, etc, is fully borne by the tenant. The deductible for damage caused by external influences, such as blowout, hail damage or burglary is € 250. burglary a police report needed to reduce the excess to € 250. Windshield damage: When replacing the glass pane has a deductible of € 75, - on condition that you go to Carglass or car Glass, abroad this Carglass International, in other firms the excess € 250. The costs resulting from a puncture are the responsibility of the tenant. Damage caused by filling the tank with the wrong fuel is fully borne by the tenant. Damages and defects below the € 100, = can be repaired without consulting the landlord at an expert mechanic, preferably a FIAT. In case of defects, such as a faulty battery, which arose out of the renter's fault (but not caused by external influences, it will look, the direct costs are reimbursed. There do need to be provided a good itemized bill. De camper was prima. Alles was aanwezig en geen problemen gehad. Van te voren is alles goed uitgelegd en na het terugbrengen is alles goed afgehandeld. 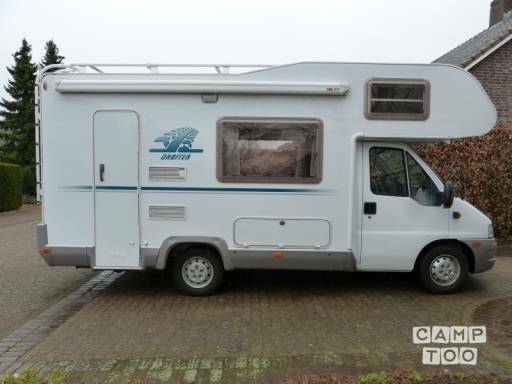 We raden het zeker aan om deze camper te huren voor vakantie! You can pick up the camper in Eindhoven at Martin.